Hey friends! 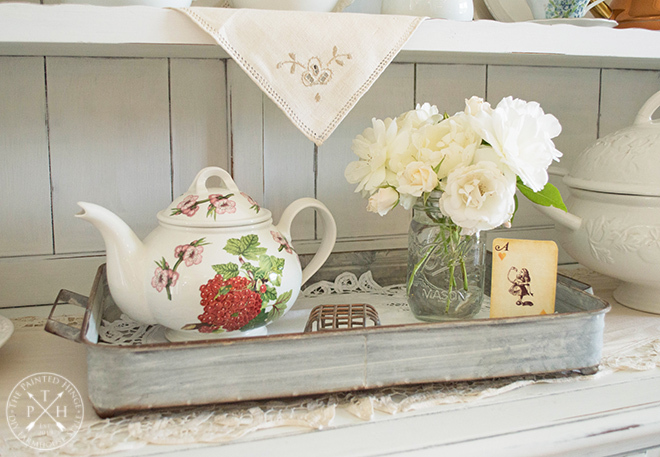 Welcome to the Tea and Roses blog hop hosted by Amber at Follow The Yellow Brick Home! 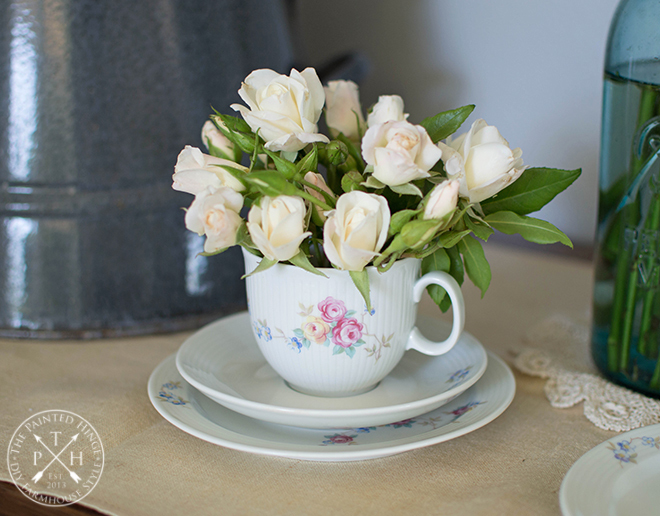 Today and tomorrow I’m joining 11 other talented bloggers, each bringing you their personal spin on the tea and roses theme! 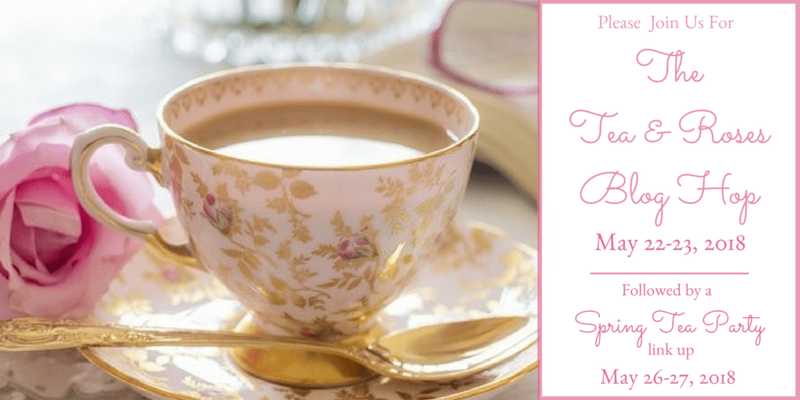 We are following the blog hop with a Spring Tea Party link up on May 26-27, so be sure to stop back by there then to join in the fun! We’re also excited to host a $75 Amazon gift card giveaway! You can enter through the Rafflecopter widget at the end of this post! 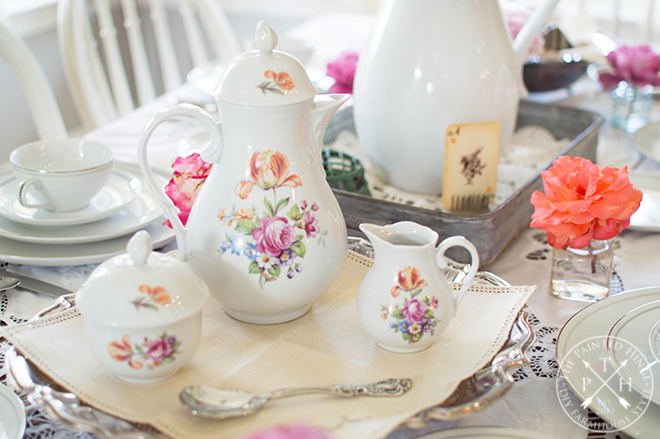 Now, on to my farmhouse style tea and roses party! 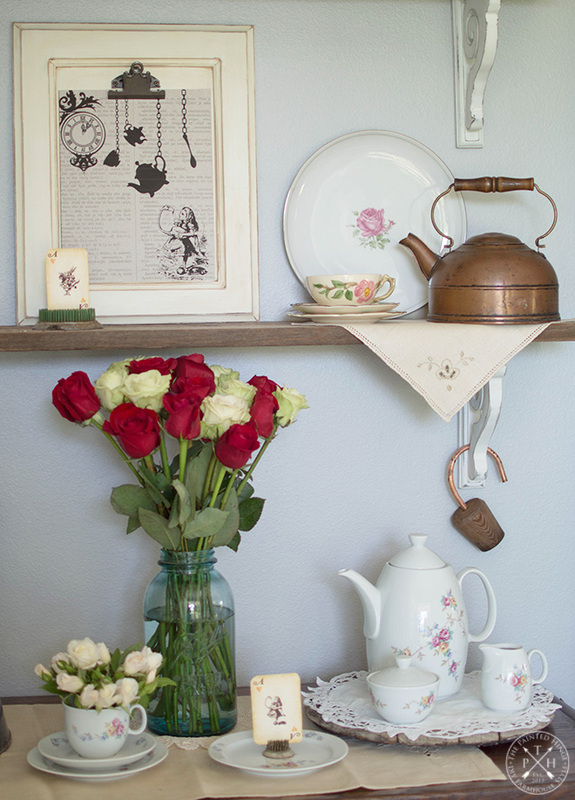 I set up my tea party in our dining room right off our kitchen. We have an open floor plan, but the dining room is off to the side a bit through this archway. I refinished both the hutch and dining set. All of the roses are from our garden except the two bouquets, which are from Costco. You can’t beat Costco for beautiful fresh flowers that don’t break the bank! The china set was my grandmother’s. The tea set below I got when I was in East Berlin in 1985. I’m always super careful with it because if I ever break any of it, there’s probably no way I could find any replacements! Don’t the chocolate dipped shortbread look delicious? Trust me, they are 🙂 I got them from Costco too! Our wine bar is tucked away in the corner of our dining room. This used to be an old cart that my dad used to reload his gun rounds (he was an avid hunter). When he passed, I refinished it to what you see here. 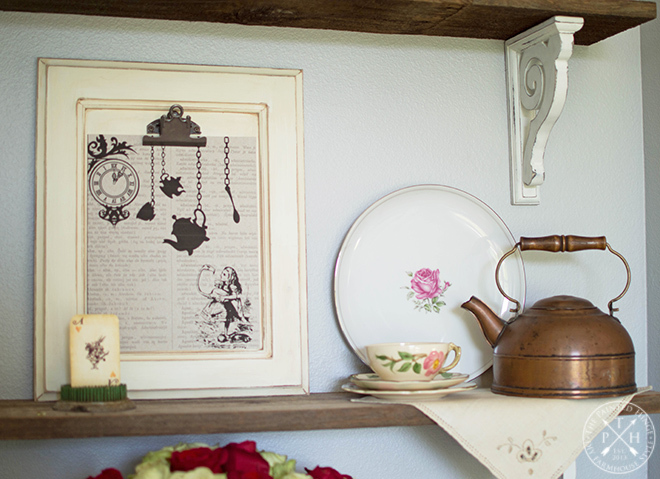 Since this is a tea party theme, I couldn’t resist adding some Alice in Wonderland touches! The best part? They’re free printables you can get too! 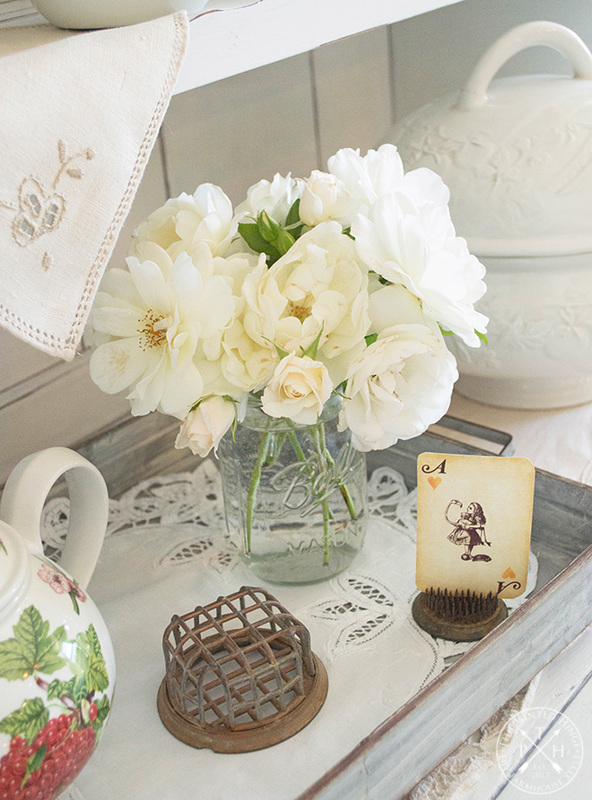 I got the clipboard graphic from Emily Rudolph – The DIY Daredevil and the playing cards from Southbound Bride. I filled the teacups in the hutch with what I call chicken egg “shorts.” Occasionally my regular-sized hens will lay tiny eggs, sometimes as small as song bird eggs. I don’t mind, as I dry them out and use them as decor! 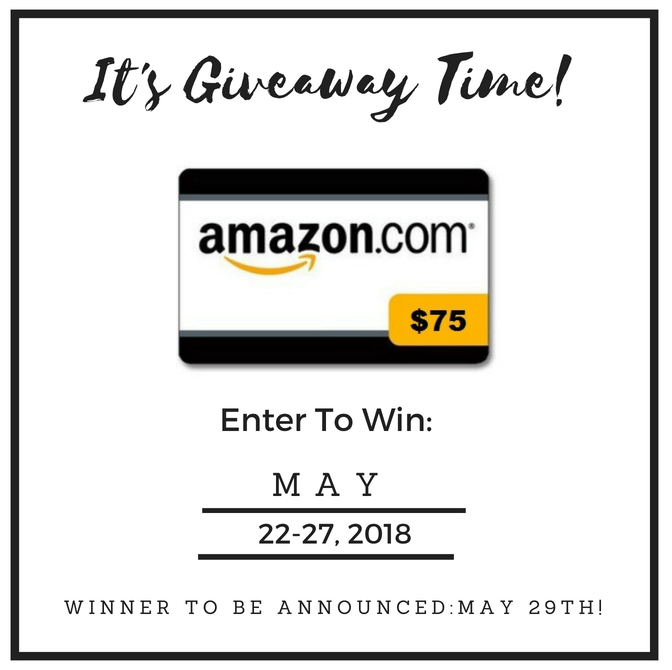 Don’t forget to enter the $75 Amazon Gift Card Giveaway below! Here’s the rest of the blog hop lineup! 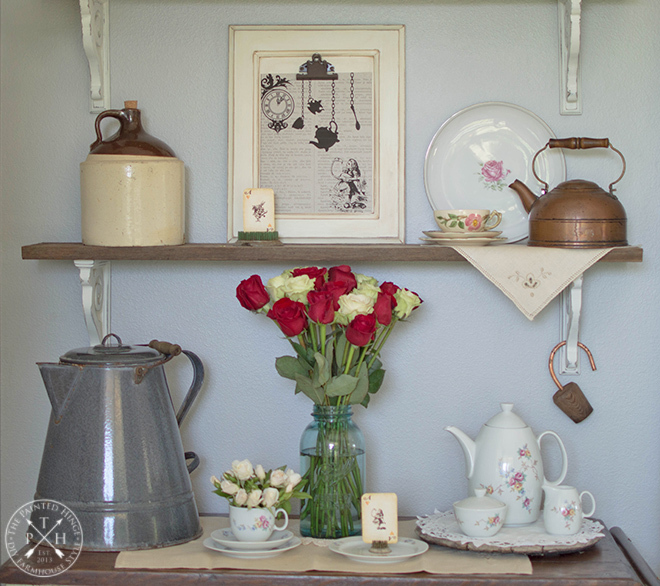 Next up on the Tea and Roses blog hop is Cecilia at My Thrift Store Addiction! You will love her thrifty style! 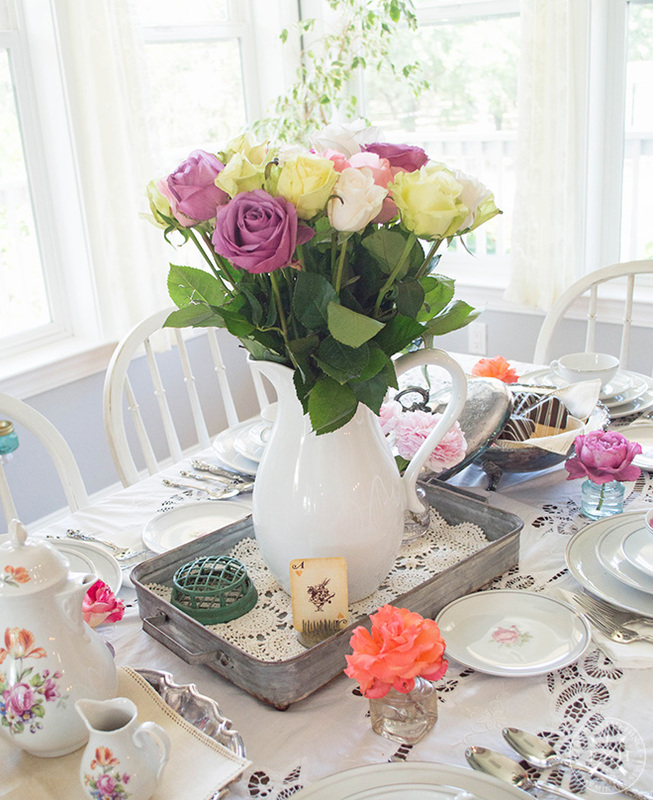 That’s it for my farmhouse style tea and roses party! I hope you enjoyed it as much I enjoyed putting it together for you! Michelle everything looks beautiful. 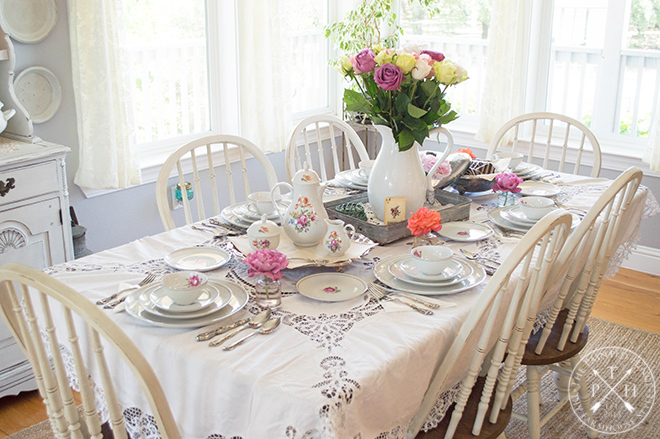 Thank you for sharing your lovely setting for tea and for sharing your treasures East Berlin pieces too. It’s a pleasure to be part of the blog tour with you. Hugs! Thanks so much Cecilia! So happy to be part of the blog hop with you! What a lovely tablescape! 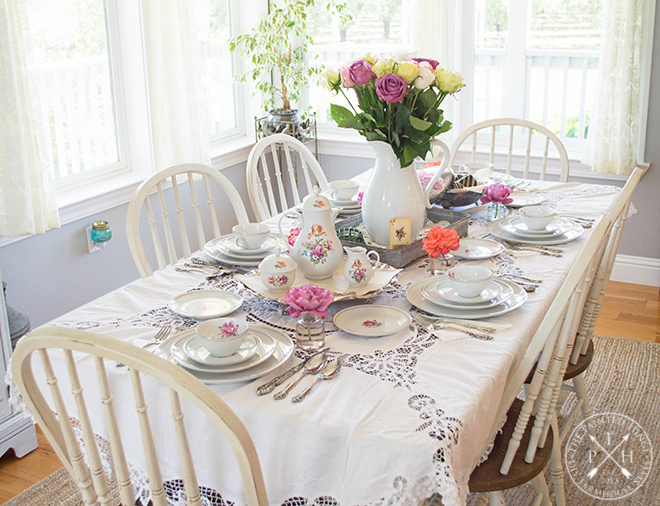 I adore the Battenburg lace tablecloth. Your hutch is darling too. I’ve borrowed one of your pretty images to use on social media. Have a beautiful day! Thanks so much Laura! Happy to be part of the blog hop with you! Your roses are just divine, Michelle! 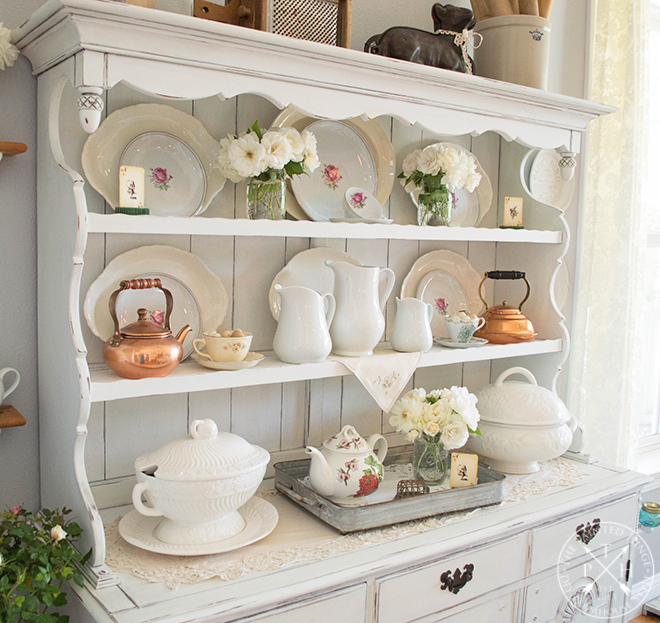 I love the copper mixed in your hutch; so trending! 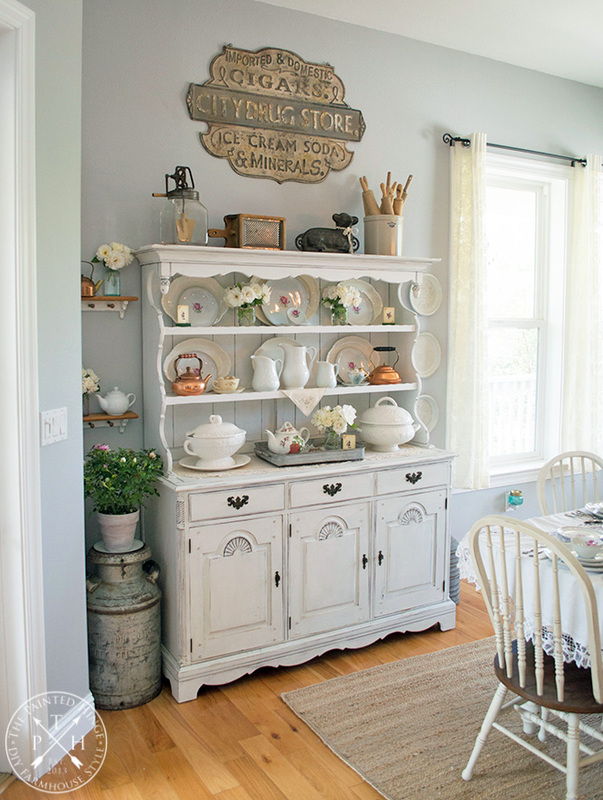 Michelle, what a beautiful and welcoming dining room filled with meaningful treasures. 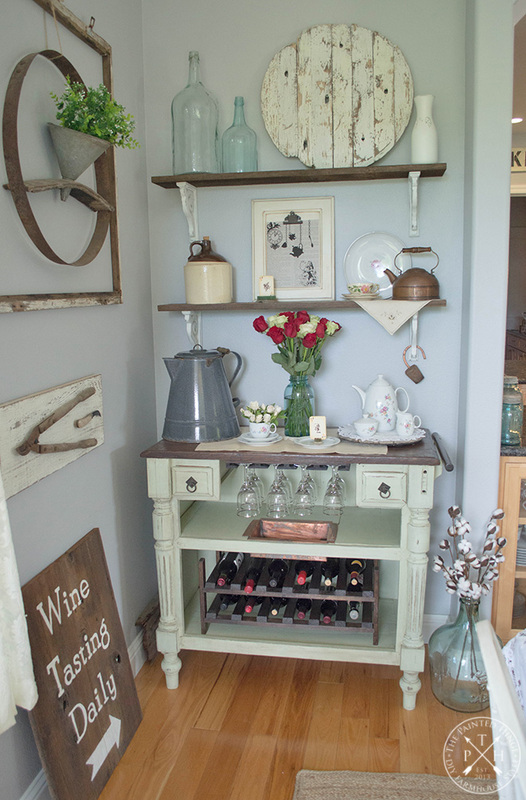 This is what makes a lovely home, surrounding yourself with the things you love! 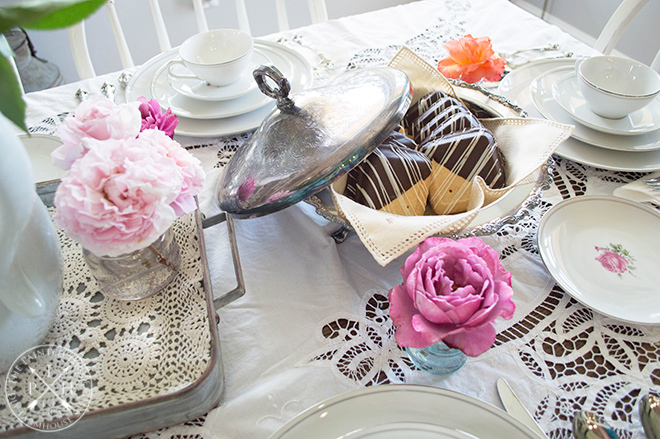 Your table is so pretty all set for tea! It is a pleasure to blog hop with you! Michelle I love everything you post, but this happens to be my favorite post you have ever done! 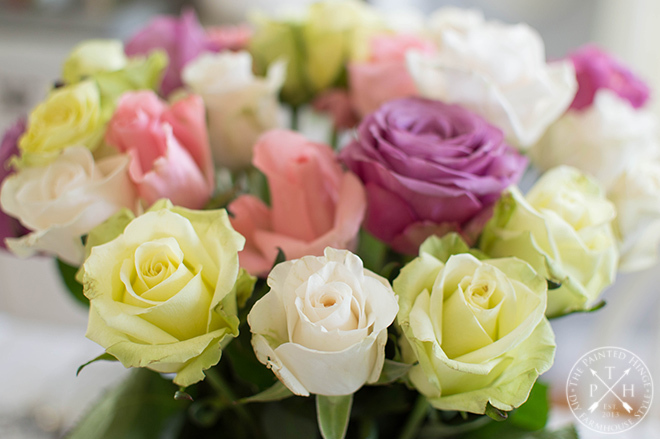 The colors of roses you have chosen are so interesting and beautiful! Your tablescape and photos are so bright and happy, I just want to come over and spend time drinking tea and taking it all in! The Alice in Wonderland theme is so perfect! Thank you so much for joining and for helping to organize the giveaway! It has been so much fun! Awe thank you so much Amber! 🙂 I enjoyed setting up the room for the blog hop. Thanks so much for inviting me to join in on the hop, and I’m happy I could help out with the giveaway! This is fun visiting everybody on the Spring Tea blog hop tour! 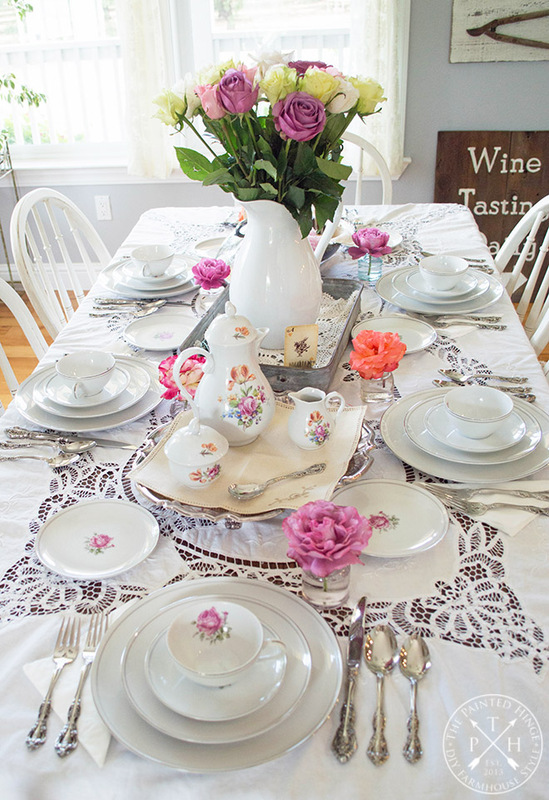 Your dining room is just beautiful with your East Berlin tea sets!!! I travelled to East Berlin in the summer of 1981 when I was on an exchange student program via Bayer, Inc. My father worked for Cutter Labs back then, which was a subsidiary of Bayer-AGFA, Inc. back then. I spent a lovely 3 1/2 weeks staying with a family in Leverkusen, Bayer’s headquarters! I thought I’d share all that as I, too, brought back pieces of china ~ seconds found at a Villeroy and Boch china shop in one of the towns along the Rhein River. My host family’s mother, Ute, had the same china in a large collection and I just fell in love with it! I also brought home 6 green wine glasses. 🙂 All part of my hope chest back then! Thank you for sharing your lovely home with all of us! Do keep your tea sets ~ they are beautiful and irreplaceable. 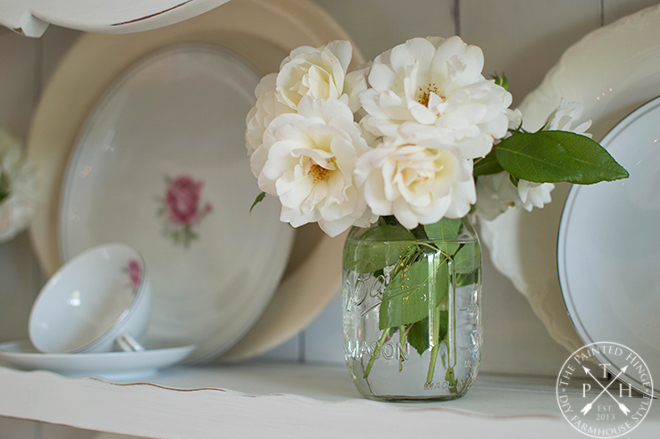 Happily pinned a bunch of your photos to my At Table, Beautiful Bouquets and Lovely China boards on Pinterest for you. Hi Barb! Thanks so much for sharing your experience in Berlin! I was in West Berlin from 1987-1989 with my now ex-husband who was stationed there with the Army. I would go on shopping trips in East Berlin with the other military wives. So beautiful friend! 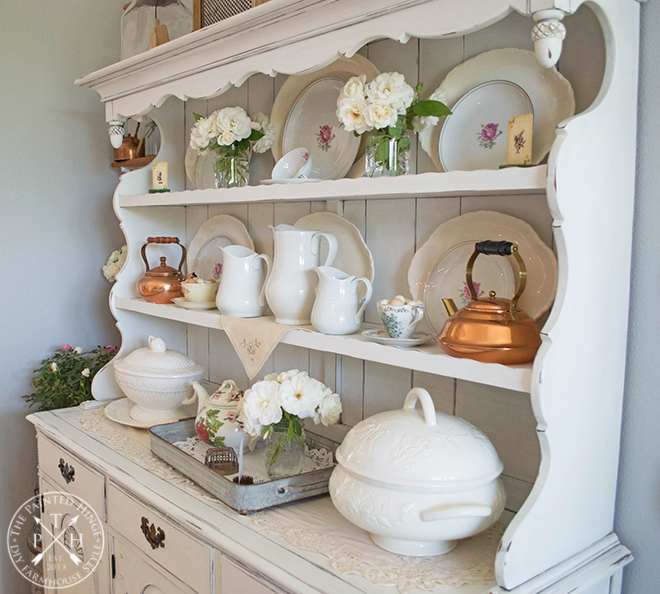 That hutch is gorgeous and styled perfectly! 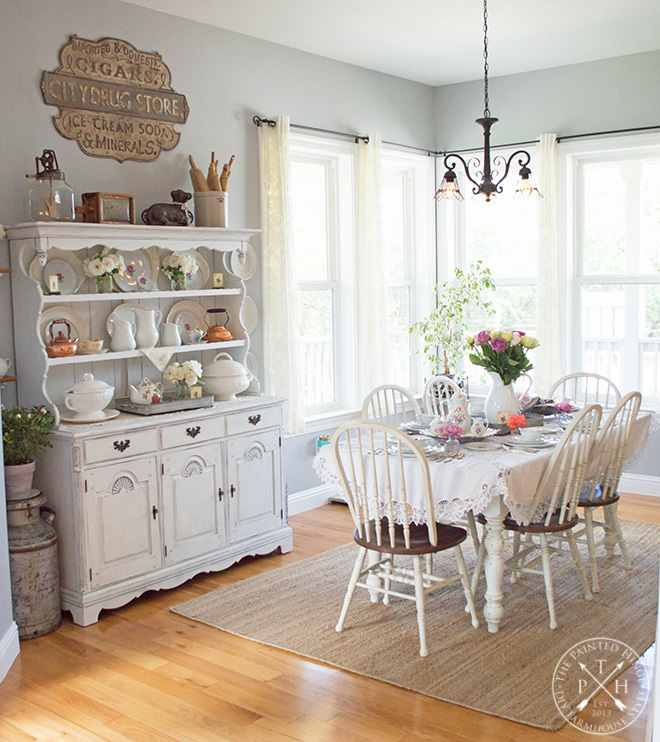 Michelle, I absolutely love your dining room! Easy to see why it’s your favorite room in your house. You did a fabulous job on the table and hutch. How blessed to have your grandma’s china, and your dad’s reloading table. Turns your thoughts to them! As for getting rid of your tea sets, I say, “no way” girl! Hang on to them for as long as possible. Some family member will cherish them some day! So fun hopping with you!! Hi Jann! Thanks so much! And I promise I won’t be getting rid of my tea sets anytime soon 🙂 So fun hopping with you too! I will spend my gift card on flowers for my pots that I haven’t had a chance to fill. Thanks for entering the giveaway Anna! Good luck! Such a light and bright room! I would love to have tea in there! 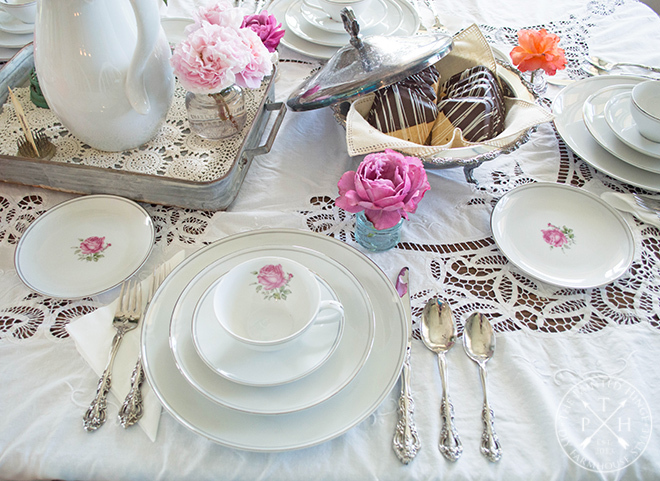 First I wanted to say how pretty are the dishes with the roses, the teacups ohhh. I’ve looked online for something like that- wow, very special. I would like to get fabric. I’ve been making pillows and am looking for fabric for pillows for my nieces. I finally got the hang of invisible zippers and I’m on a roll, just need more fabric, but want pretty fabric. Thanks so much Rosie! 🙂 And thank you for entering the giveaway! Good luck! 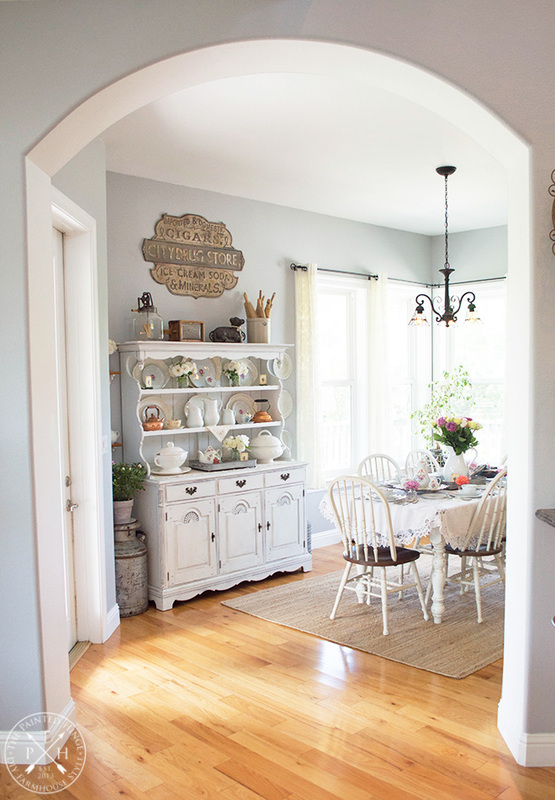 This dining room is so lovely! Makes me want to set my table (and it’s bedtime as I write this!) Thanks for the inspiration! Just discovered your blog and I like what I see! If I win the gift card, I’ll probably use it to buy some books for my classroom and some home decor items. Thanks so much Tammie! 🙂 And thank you for entering the giveaway! Good luck! 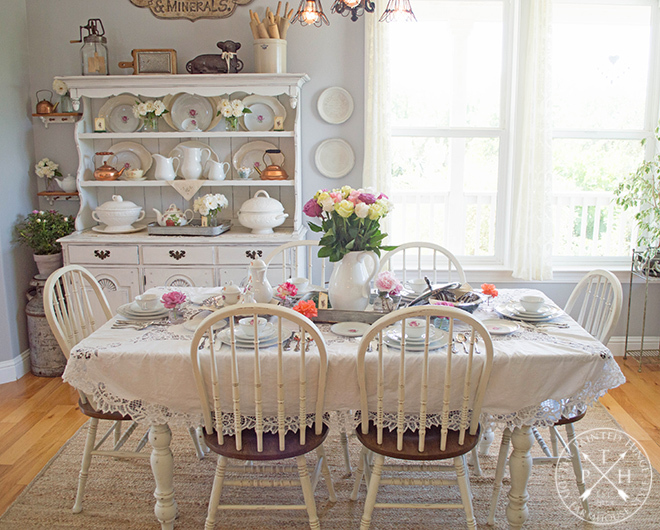 Your Dining room is just wonderful!I really love everything,such inspiration! 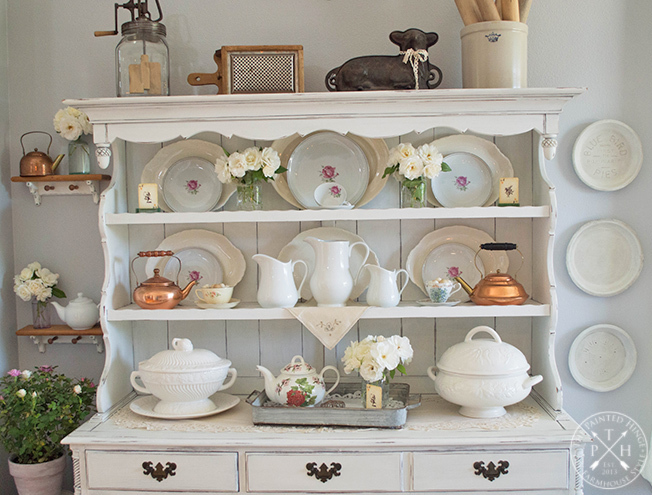 What a beautiful post showcasing so many lovely things that are not typical “Farmhouse” items!! 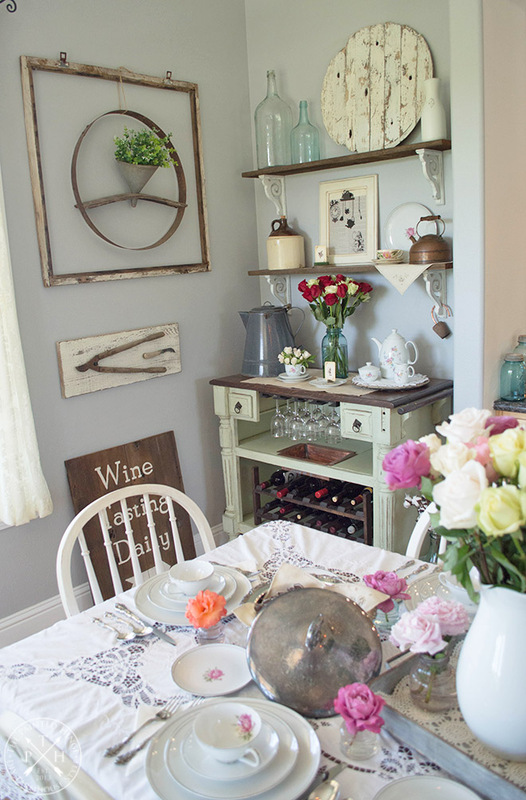 Your Dining Room looks lovely and looks more like what used to be called Country Victorian! Lovely china and tea sets!! Just stunning!! 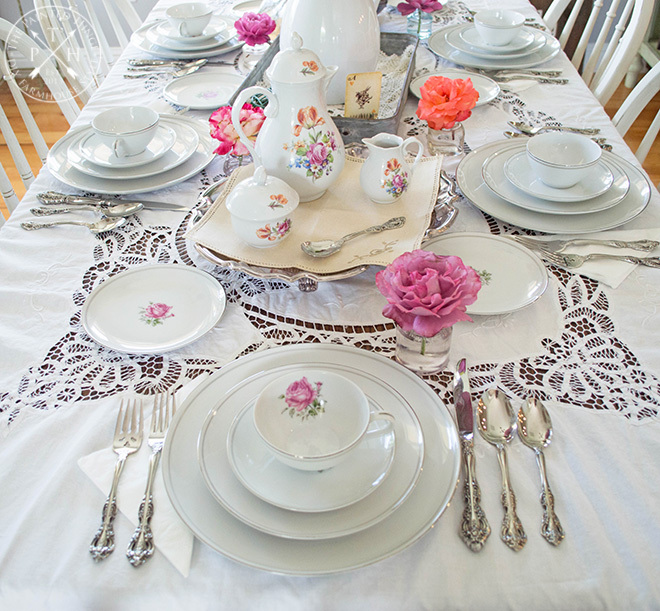 And the lace tablecloth is gorgeous!! Thanks for participating in this blog hop and I am looking forward to the link party!!! I just love your tea party! I love all the flower frogs! I can’t get enough of them lately!! I also loved your tea set from your time in East Berlin! Gorgeous and so special! 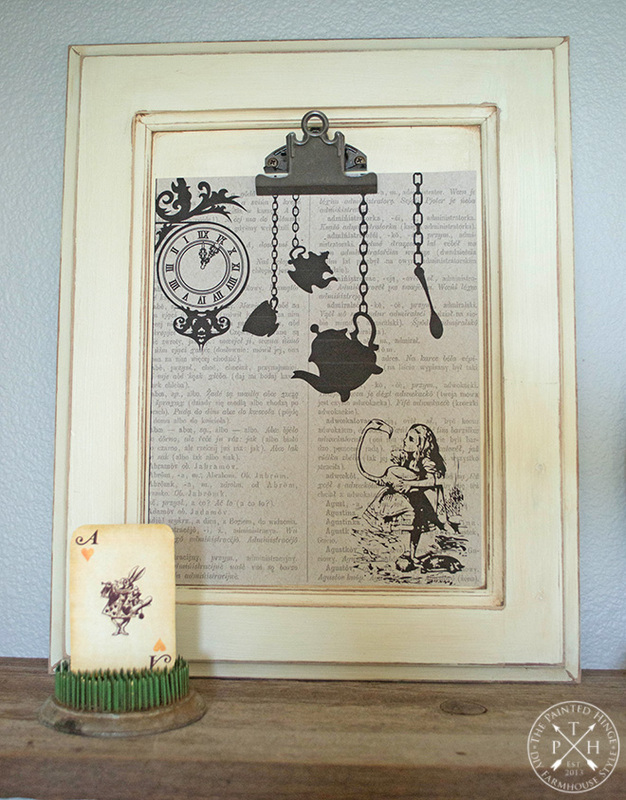 The Alice in Wonderland touches are so perfect!! 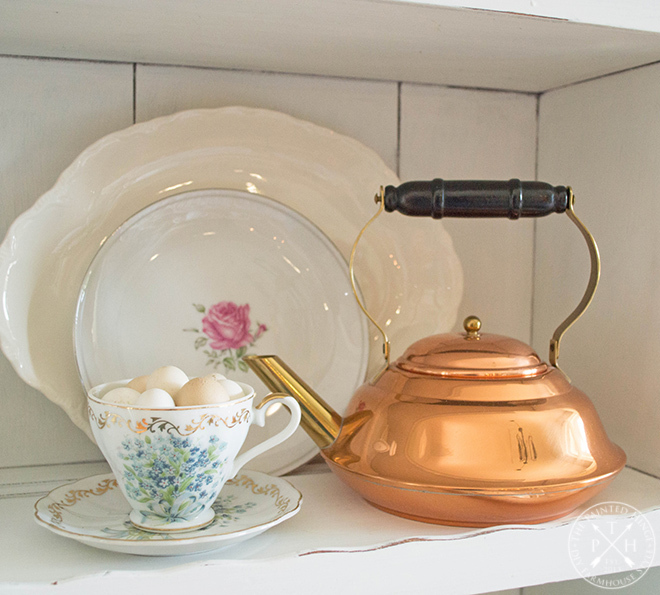 I am hoping to open my b&b with a tea room…so would definitely use it to buy more teapots and accessories! I love your pretty room, it’s so warm and inviting. 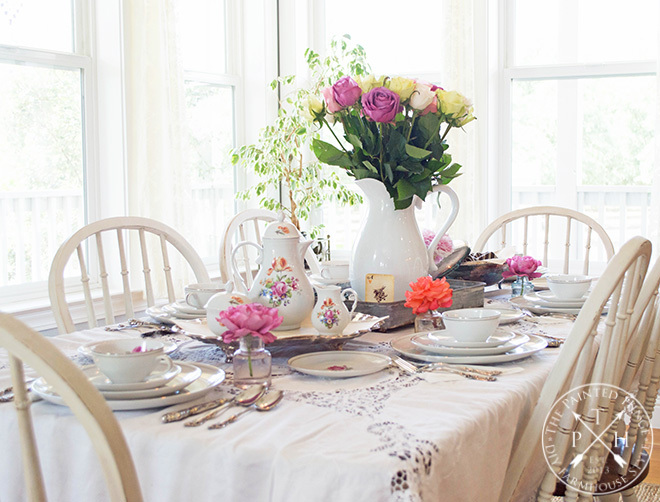 Your tablescape is beautiful, such a lovely china and the pitcher with flowers brings the loveliness together. Your tea set from your Berlín days is very pretty. Loved all your roses. Keep those teasets! 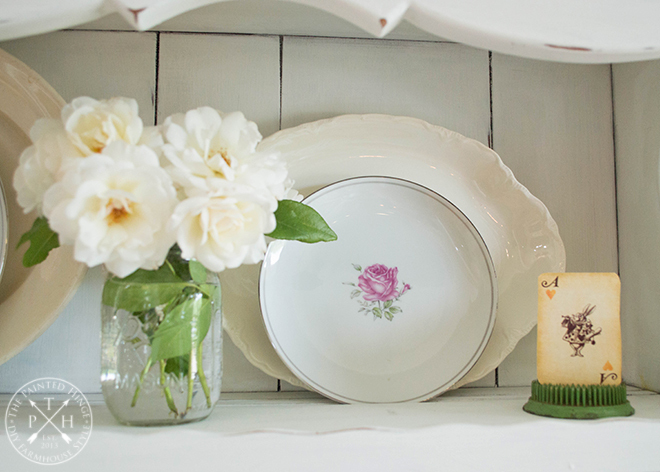 I am a pink rose dish fanatic and loved your settings to pieces. What a restful, happy, loved room!